Regardless of all the diet advice and regimens out there, it’s an undeniable fact that having a large proportion of living, raw foods in the diet keeps the body healthy, feeling good, and looking good. There are also many ways which raw foods benefit yoga practice. While it is possible to practice yoga to benefit in any condition, it is smartly encouraged that health is a prerequisite for making the most of your practice. Who wants to practice yoga when they’re sick…or do anything when they’re sick? (actually sometimes practicing is the best thing you can do when you are sick). Ones’ health is largely determined by food. Raw food serves two main roles in preventing disease and discomfort. 1. The watery-fiber content keeps the digestive system clean and regular so that bad things don’t take root there. 2. It alkalizes the body so that pathogens have a difficult environment to survive in, and the immune system flourishes. This also reduces inflammation and generally assist detoxification. 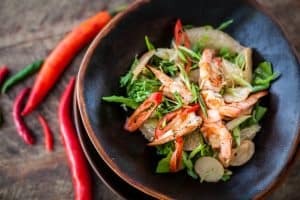 Of, course there are many other reasons to eat raw, like; easier digestion, higher nutritional content for most raw veggies(although some veggies and some nutrients are more easily absorbed from the lightly cooked form), fresh vivid flavors, improved metabolic and assimilative functions, and healthy skin. Yoga incorporates many special exercises which specifically help cleanse the digestive system. Often times if heavier food is eaten, such as pasta or meat, you find while performing these exercises it doesn’t feel good even if your last meal was the previous night. The abdominal pressure from practices like Uddiyana Bandha and Nauli Kriya can reveal the condition of your intestines. Poor food choices make bruised or tender feelings and healthier food choices make the practice easier and more enjoyable. Many people may be unaware that they could utilize bandhas more if they ate a majority of raw food and in moderate portions to keep their intestines feeling pure. Bandhas, or locks, are one of the key ways in which stability is maintained in yoga poses, focus is developed, and energy is made to flow more efficiently in the system. In Yoga’s sister science, Ayurveda, there are prescriptions for how to eat a Yogic diet which is based on recognizing three kinds of effects. Food items are placed into categories as agitating, dulling, or balanced for their effect on the nervous system and mind and the condition of the food item itself. As one might imagine the prescription is to eat primarily foods of the “balanced” type, sattvic, and use the other ones sparingly and accordingly. Once food has become cooked, in particular, overcooked, or dead…it is generally considered to be dulling, or tamasic. This may be why so many cooked food items are not delicious until they have been sugared, salted, or spiced in a unsuccessful attempt to be made balanced. Typically, these foods became dulling to the body for their cooked bulk(carbs and protein), and stimulating, or rajasic to the mind, because of their flavorful additions. A Sattvic diet typically consist of raw or appropriately cooked food which is easy to digest, sweet, or spiced with sattvic herbs such as basil, cardamom, cinnamon, coriander, cumin, fennel, fenugreek, fresh ginger, and tumeric. These foods are sustaining and healing for the body and create a calming and focusing effect for the mind. One might consider these qualities indications of or aids to intelligence, and are very beneficial for Yoga practice. Calm, yet focused…means not over zealously practicing Yogic exercises, a safer and perhaps more creative and intuitive practice. Calm, yet focused…leads to an ability to stay peacefully with yourself and be naturally inclined towards meditation. You can note how raw food is essentially a sattvic diet. 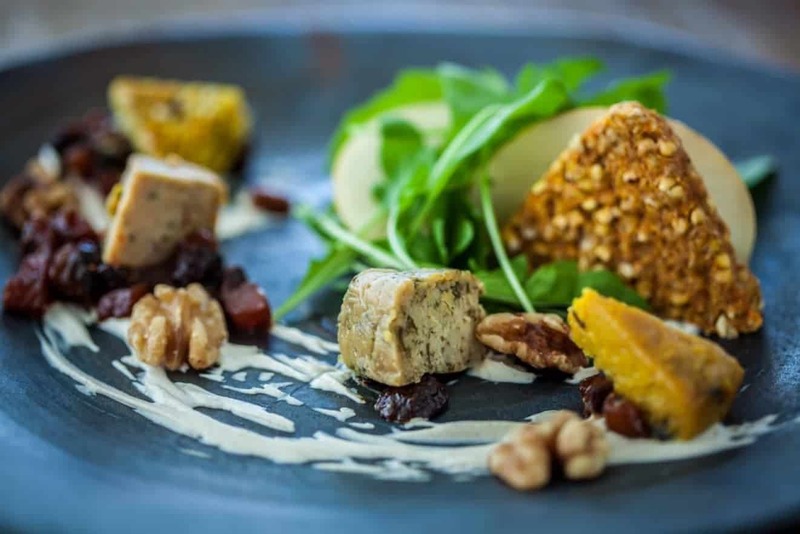 At least once a year at Vikasa Yoga, there is a Raw Food Yoga Retreat, directed by Kosta Miachin and famous raw food chef, Boris Lauser who contributed quite a few items to the menu at the Vikasa cafe. At this retreat you can actually feel for yourself the benefits of a raw food diet for Yoga practice and learn to make the best recipes. 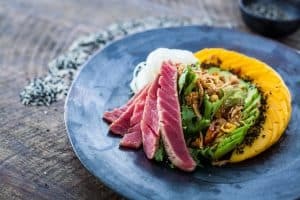 Even Boris himself is not a 100% raw food eater, as you can find out in the interview below, and for that, during this retreat, healthy cooked Thai food is also available. As with all transformations, there’s no need to hurry. While more raw food will certainly benefit your health and yoga practice, enjoy the journey by doing what feels right 🙂 Below please enjoy Boris’ raw food discovery! What led you to Raw food as a lifestyle choice? I was overweight as a child, eaiting lots of sugar and bad foods. My favorite was Nutella melted on warm toast with butter 😉 After my brother had talked about this guy Brucker, stating that the evil of today’s society is white flour and white suger and after I lost 2 kilos during a stomach infection in a week, I took that momentum of low appetite and continued eating just half portions for 1 year and MOST IMPORTANTLY stayed away from sugar completely, i.e. NO sweets whatsoever for 1 year. After that experience, I put a spoonful of Nutella into my mouth, just like in the “good old times” and I spit it out: It was disgusting. At the age of about 22, a book from a Harvard professor “fell into my hands” turning the food pyramid upside down, putting vegetables and fruit on the bottom, followed by grains, seeds, legumes, nuts, and leaving just a little left for dairy meat and fish products on the top of that pyramid. Grains were required to be whole grains, no factory processed flours or sugars. That made total sense to me and I continued changing my diet towards heavy loads in vegetables and fruit, cutting down even more on carbohydrates and especially leaving out the processed ones. I also naturally ate more raw, favoring salads for lunch and fruit salads or smoothies for breakfast. It was during my time working in Italy for the Food and Agriculture Organization of the United Nations (FAO) that I manifested this diet with all the amazing fresh produce and at the same time discovered my strong passion for food, the culture of food and tasting amazing pure naturally preservative free foods in a country that is known for their simple dishes that are amazing if the base product is simply the best! It was with that experience, I went on a business trip to San Francisco. As a foodie, whenever I travel I seek out all the good places to eat, organic, local, vegetarian/vegan friendly, etc. So of course, I also came across Café Gratitude, one of the most famous raw food cafés ever. I ordered a raw vegan cheesecake and a mint chocolate chip ice cream shake, all dairy free, free from processed sugars and raw. And it was simply delicious, finally, something sweet again that I liked. I had found the coffee shop of my dreams 🙂 I soon discovered the attached life style and the vast depth of this whole new culinary world, found out there is a program to become a raw food chef and then, a couple of years after, quit my job, and followed that path, which really began when I was 16, when I stopped eating processed white sugars! What has been the most profound effect of your diet on your life? Do you eat only raw food? Is all raw, all the time, for everyone? I am a flexitarian in all respects. I am neither 100% raw, nor vegan or vegetarian. But I am strict when it comes to quality. I do eat mainly raw food and feel the best if I have raw breakfast (green juices, smoothies, homemade coconut yoghurts, fresh fruit) and a massive hearty raw salad with a great dressing for lunch. Evening meals can be raw but are often cooked as well. I LOVE to go out for dinners and then eat mostly cooked. I look for local organic restaurants that cook with true ingredients where nothing comes from a package. If I have one dogma, then it’s NO FACTORY PROCESSED FOODS!! I think a big raw food percentage is beneficial for everybody, i.e. if you can integrate at least 50%-60% of raw food daily, you can highly benefit, and I believe this holds for everybody. Now some people then strive on 100% and are very well, others struggle, and are better off with 60-80%. So, it depends on your body type and what your body asks for. Once you recalibrate your system with genuine good food, home made meals and only natural ingredients, generally low on sugars, your body will tell you what’s best for it! 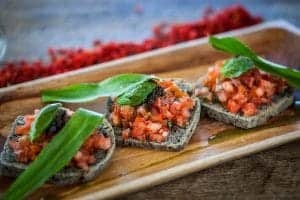 How would you recommend someone with limited time or motivation get into eating raw meals that are interesting and delicious… until they can come learn from you or take our Raw Food and Yoga retreat? Generally, I suggest to start to integrate some raw food with every meal. Have some fruit for breakfast, and some salad with every meal. Then, if you want to do the next step, get a high speed blender and start making green smoothies. These are the easiest things that takes the least amount of time and provides you with maximum nutrient gain! Just blending leafy greens and fruit. It’s that simple and is a brilliant breakfast and snack throughout the day and really helps getting into raw food and adapting a raw food diet, preparing the body smoothly to digest raw food better. Slowly substitute processed carbohydrates (white flour and all the products made from it, white sugar products, white rice etc.) with more vegetables to get your body used to fibres. Once you have adapted to a diet low in fish, meat and dairy products, low in processed carbohydrates, but high in vegetables, salads, fresh fruit and whole grain products, the switch to a diet high in raw foods (60-100%) will be very easy.